You know you are getting old when you read a history book and realize you knew nine of the people mentioned. Encountering those names was an unexpected pleasure when I got a review copy of Rounded Up in Glory: Frank Reaugh, Texas Renaissance Man by Michael R. Grauer. 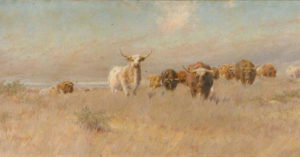 Reaugh (1860-1945), pronounced “ray,” was a Texas artist best remembered for his impressionistic pastels of Texas longhorns. 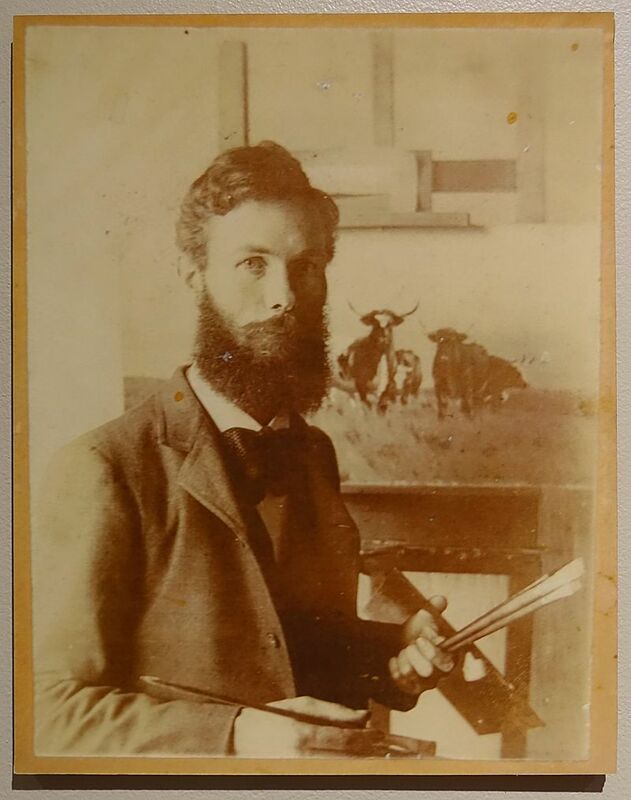 Known as the “Leonardo of the Longhorn,” Reaugh was a peer of cowboy artists Frederic Remington and Charles M. Russell, but unlike them he was in Texas during trail-driving days and actually witnessed what he painted. He focused much more on the longhorn than the cowboy and produced hauntingly beautiful landscapes of West Texas. 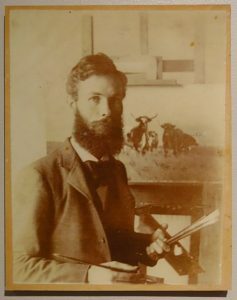 An Illinois native, he came to Texas in 1876 and came to love the land, the longhorns and art, eventually earning the honorific title of “Dean of Texas Painters” for his plein air techniques and his influence on other outdoor Texas artists. His work “The Approaching Herd” is his best known piece. Reaugh is less remembered than Remington or Russell, who were much more commercial in outlook, selling their art, whereas Reaugh saw his body of work as a historical record of a time before the plains were fenced and plowed. When he died, his will stated that that he wanted his pictures to be kept together for historical reasons. Problem was many had been split up among various institutions, including the Panhandle-Plains Museum in Canyon, the University of Texas and Texas Tech University and its Southwest Collection, where I did a lot of my early research and even served a year as interim director before I moved to Angelo State. The estate took more than two decades to settle, though some claims on ownership remain unresolved. My Texas Tech connections mentioned in the book included former Southwest Collection Directors S. V. “Ike” Connor and R. Sylvan Dunn as well as administrators Curry Holden and Bill Parsley. The two mentioned TTU connections I got to best know were former Tech President Grover Murray and former Gov. Preston Smith, a Tech alumnus. My Western Writers of America affiliation allowed me to meet artist Tom Lea and Texas historians J. Evetts Haley and Don Worcester, who are also included in Rounded Up in Glory. So, renewing old acquaintances in print has been an unanticipated joy in reading Rounded Up in Glory for review.